I admit I am fascinated by the mythos of the Secret Gospel of John. In it, you start out with the Divine Presence... who seems to me to be utterly fluid, the impersonal presence of the Divine. From this Divine One springs Barbelo and a whole host of Aeons. These Aeons can be looked at various ways. They are gods or aspects of the Divine Monad. The One burst into the Many and the great adventure of Modern Gnosticism is to make that journey of the many back into the One. It is here that I can "grok" what many modern Neo-Pagans are saying. I see the Masculine-Feminine side of the divine found in Wicca. I see the many found in other belief systems. I see the spirit of life in all things in animism and the presence of the impersonal Divine of the Pantheists. Question Seven: What is the Thomasine's Defining Characteristic? Question: What is the defining characteristic of the Thomasine tradition's approach to the cultivation of Gnosis? Within the Gospel of Thomas two things pop up again and again as their signposts to gnosis. The first is: "Know yourself." The second is: "Know/Remember where you came from." Really, these two things are one thing. We are challenged to know that we are sons and daughters of God. We are called to remember our Original Innocence in the proverbial Garden. The message of the Gospel of Thomas is not original sin, it is not that we are damned. It is that we were made in the image and likeness of God. So all of us are sons and daughters of God. Every last one of us. Some have just forgotten who they are. Therefore our lives should reflect this, through authenticity, protecting our brothers and sisters, and living a real life.. an awake life. The Gospel of Thomas does not enshrine Jesus as the only way to God. Rather for the the Thomasine Christian, Jesus is their way to God. For me, as I come to meditate on Jesus and his words I see God through him, as a mirror reflected back at me. Thus God speaks to us through Jesus but that is not the only way God speaks. There could be numerous images of God throughout the world, many lights, many messengers reflecting the one Light of God. I believe that when a person responds to the light they have been given, respond to the truth they understand, then that truth is God as Truth. The Gospel of Thomas is not a book for theological masturbation and self pleasuring. Rather it is a book to be meditated on. It is a book challenging one to know (gnosis) who they are, where they are from and where they are going. Question: What is scripture and how is it to be used? This continues on the questions my bishop gave me some time back to answer from a Thomasine perspective. It seems to me that for a Thomasine, The Gospel of Thomas is primary. Every other scripture would be looked at in light of the foundation of the Gospel of Thomas. So the other Gospels, the Hebrew Scriptures, the New Testament, the Nag Hammadi scriptures and other later Thomasine writings can be valuable and helpful but the foundation remains The Gospel of Thomas. I have recently returned from an online time out as you may have noticed. There are quite a few reasons as to why this is, one being simply being with my family. My step-father's cancer has returned and things are not looking good. (Prayers welcomed!!!!) Also in my work, I have really been blessed and challenge in my work with inner city kids. They have so many needs, and I see how little of me there is to go around in simply being there for them. It is heart breaking. This realization has really hit home the past couple of weeks. While I consider Jesus my guru and teacher, these kids are also my guru and teachers. It is they who simply by being them, reveal my own weaknesses and faults. It is also through them that I receive the grace of the Lord. Question Five: What is the Community? In the Gospel of Thomas there are hints of community but a lot of emphasis is given to the solitary in the GoT. In fact, I would argue that a lot more emphasis is placed on the solitary than in the community. However that said, I do believe there existed some type of community. I think there may be clues that can lead us to infer within the text. In the Gospel of Thomas, it is very clear that a person can know God and who they are in God apart from any mediators. Jesus comes from God to teach any who would have his guidance. He is a teacher who came from God and can show the way back to union with God. As for angels, spirits, etc... it is left open. A person may or may not believe in them. Question Three: What is Man? Humanity is best described as the children of God. Humanity bears the spirit of God within them. Humankind is called to know God and to know themselves as Gods children. Other metaphors are used as well, that of beloved entering into the bridal chamber. Being children or lovers of God are metaphors for this call to union with God. Question Two: What is Gnosis? Gnosis in a Thomasine context is twofold. It is knowing yourself as a child of God and knowing God. This knowing is not so much as faith as a revelation or epiphany that you come from God and are called to union with God. As I continue to reflect on the question of "What is God to a Thomasine?" I find myself seeking to clarify my earlier statements. I think for a Thomasine, the way we see God is through Jesus. I would also clarify that when I use terms like Trinity, I am not necessarily meaning the orthodox definition of Trinity. God is seen as Father and Mother. But Jesus seems to have come from God. Was he created or emmanated at some point in history? It very well could be. It is as if the Son, the "Cosmic Christ" existed in the heart of God as a "part" of God and took flesh or embodied in the person of Jesus. I know not all Thomasines see Jesus as God, yet I think to be faithful to the scripture, one would have see Jesus as a huge part of the Thomasine faith. I have come to be convinced both through the scriptures and my own UPG (unverified personal gnosis) that Jesus is in some way divine. Question One: What is God? Ah starting with the lightweight stuff! Sheesh! I will remind my readers that I will be giving most credence to The Gospel of Thomas and the Odes of Solomon, but also some to The Acts of Thomas, The Book of Thomas the Contender, and The Hymn of the Pearl. I am convinced that the Thomasine Christian faith thrived and developed within Syria, and that this Syrian Christianity can provide some clues on the theology and practices of the Thomasines. God is defined in the Gospel of Thomas as Father, Son, and Holy Spirit our Mother, in a type of Trinity. The Father also called the living Father is mentioned numerous times in the Gospel of Thomas. Some would argue that Jesus is not considered divine in the Gospel of Thomas, but after what I would say years of wrestling with the text, and even wishing it were not in there, I am convinced that the Gospel of Thomas does portray Jesus as Divine. My bishop has asked these questions within our schools of thought/traditions within our church. He asked me to consider these questions from a Thomasine Perspective..trying to answer what the tradition would say, and not my own personal take. So I will utilize the Thomasine/Syrian Writings: The Gospel of Thomas as a primary and earliest texts, but also The Acts of Thomas, The Book of Thomas the Contender, Odes of Solomon and The Hymn of the Pearl. What role do mediators play (angels, etc.)? What is Scripture? How is scripture to be used? What is the defining characteristic of the traditions approach to the cultivation of Gnosis? What role is does liturgy play in worship and the cultivation of Gnosis? 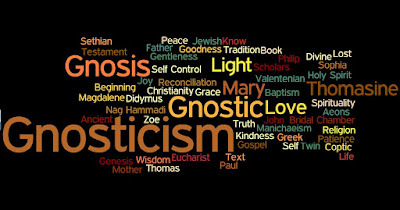 Do modern Gnostics believe in grace? I think they do. I do. For me the whole process of gnosis is grace from start to finish. Just to realize there is more to life than meets the eye is a grace. To open up to the revelation that I am a son of God is a grace. To live as a child of God is a grace. Jesus, our older brother is sent of God...emanating from the very heart of God to seek us out. So many of us are asleep, drunk or blind, but for those with ears to hear he invites us back. Remember where you came from. Remember. And this calling as a son returning to his Father, his Mother is also offered another metaphor...of entering the bridal chamber with one's beloved. We are called. I did some major cleaning yesterday. With it I cleared spaces for my every increasing number of altars. (How many is too many?) I now have a space for several types of divination. Cards and Pendulum seem to be my preferred and most accurate. Last night I went out under the new moon. The heat of the day was still there, just not as intense, threatening to drive everyone indoors. No, there was a bit of a breeze, yet there was no denying it was summer. The night sky dark moon was hidden completely, yet the starts sparkled like a thousand ancestors watching over the earth. The new moon to me represents beginnings. The ending of something and the beginning of something new. My vacation is over and I will be in a new space with a new team in my job. It is a promotion, but it still makes me nervous. I whisper my hopes like prayers to the new moon. Prayers for health and protection for me and mine. Prays for the earth and our nation. My fears have accompanied me out there, like an old familiar friend. They are my sacrificial offering. I offer my fears, my worries...sacrifice them for a better future. I have an altar with all kinds of statues on it. Each one representing something different. Jesus, Mary and St. Jude are there. So is Krishna and Sophia. The Morrigan and an African statue. I honor them not so much for any religious meaning, but for the symbols they are. They represent spirits of mercy, kindness, miracles, divinity in all things, strength and protection. In asking for their boons, I offer flowers, water, and incense regularly. It is a simple thing, and yet it is a part of me. They say that confession is good for the soul, and I suppose it is. I have something that I have tried to write for several days now, and each time ditch what I wrote. You see, I have this blog. Yes, THIS blog. It was all about that mystical text the Gospel of Thomas. It is a fascinating text that I have studied for several years now, and I decided to write a personal commentary of my exploration of all 114 sayings. I found it to be a riveting journey. It was when I finished that the big experience happened. I got it. I totally internally "got" what the teaching was telling me. I am not saying this to brag. I am not telling you this to gloat. Hell, I don't think I did any thing to experience it. But I did. And with that, I no longer needed the Gospel of Thomas. My 6 to 7 year romance with it died like the flowers I left my first girlfriend, who was in love with my best friend. Interestingly enough in the Gospel of Thomas, Jesus does not set down a list of religious practices for his students to follow. Instead he challenges them with the notion to be authentic. If you do religious practices while wishing you did not have to.. he lets you off the hook. "Do not do what you hate. Do not lie" he says. Jesus in the Gospel of Thomas is not one who supports nor neglects religion. He seems to support what is skillful in remembering your true nature, and to disdain that which demeans the person. How beautiful this teaching is. How hard for someone who comes from a religion of works to deal with! It goes without saying that the Gospel of Thomas presents Jesus in a way than is presented in modern Christianity. For me this took a couple of years to finally realize that the Gospel of Thomas is not Christian..not any modern sense, nor really in any form throughout most of "Christian" history. The Gospel of Thomas (GoT) is a text of the sayings of Jesus. But the Jesus it presents is a wisdom teacher...more in line with Eastern Masters as found in Buddhism, Hinduism, and Taoism. I believe the GoT can best be applied and lived today with an understanding of Vedanta. Vedanta is derived from the teachings in the Upanishads. In the Upanishads you find the core teachings of the guru or the teacher of the way of liberation, the soul, God, and meditation. These teachings are also found in the Gospel of Thomas. In my previous post, I pointed out the problem with leadership in how it has been utilized in many faith traditions and my own experience with some of the best and the worst of leaders in various traditions. Yet, I will not disparage the need for spiritual leadership, I just think that it needs a radical transformation. The model I would like to hold up is that of the soul friend-anamchara. I hear this and think of the sayings in the Book of Proverbs in the Bible.. "Faithful are the wounds of a friend" and "As iron sharpens iron so one person sharpens another." The message of the Gospel of Thomas is this: We are children of the living God. This God is a God who is bigger than any religion. Sadly so many want to follow a lesser God, a God that does not act like a Father or Mother but rather like a spiteful dictator. The message is so clearly portrayed in The Hymn of the Pearl, where the calling is to those who have forgotten who their Father/Mother is..to remember their birthright. What is your God like? Planted some catnip, cilantro, and mint yesterday. The rosemary and lavender transplants are doing great. I am only a beginner gardener but I am really loving it. It brings a sense of interior peace and silence while doing it. I am so thankful for the opportunity to be able to do this. For the past four or so years, I have been taking a Hoodoo Rootwork Course. I am nearing the end of it, and finally at a point where I am doing some of these workings on a regular basis. Slowly feeling more confident in my workings, and I am noticing that this stuff feels like a part of me. I was nervous even posting about it on the blog, as I have kept it largely Thomasine and little else. But this too is part of my path. I made a mojo bag last week. I took a traditional Hoodoo bath today. (Been tasting salt on my lips all day) I have my own personal theology in this as Hoodoo has a type of Christianity background... I have just adapted my own Thomasine Christianity in it. One of the things that is beautiful and fascinating to me in the Gospel of Thomas is the idea that God is Mother and Father. Our first relationship is with our mother in her womb. She knows us and has known us at our earliest stages. She birthed us. Our Mother and Father are our first primary relationships. They know often know us better or as well as we know ourselves. We share their nature. This is the message of the Gospel of Thomas. We are children of the Father and Mother. We share their Divine Nature. In fact, this divine nature, this divine spark can be seen within us. This is the kingdom. It can be seen in nature, in other people. Like St. Francis and Rumi realized... all things are our relations. We are brothers and sisters with all things. We are lost in a dream longing to wake up. Having concluded my commentary on my ship's rudder "The Gospel of Thomas", I have enjoyed time spent in nature, time spent with family, and time spent doing simple gardening. It has also allowed me some peace in that I did not feel the need to try to do anything. It was that natural way that the Taoists speak of. I have let arise naturally the the questions, "So what does it mean to be a child of God? What does one do? How does one live?" over and over like waves coming in, receding and then coming in again. It is here while I think there are some universal answers, I believe there are some that are individual as well. Great stuff. Enjoying a crisp cool morning, cloudy skies. We had been having near 80 degree weather already so this is a nice respite from the growing warmth. This morning I went out onto the front lawn. The grass was covered in a beautiful white frost. Our weather is having a hard time deciding this year if it wants to be warm or cool. I walked onto the grass and pressed my toes and bare feet into the grass enjoying the tingling cold on my feet. Closing my eyes I imagined sending roots deep into the earth. Drawing life from the earth on the in-breath, I allowed it to fill me. Breathing out I sent any stagnant energy out through the crown of my head imagining a willow tree that the stale energy flowed up out and down into the earth to be restored once again. Blessing the earth and the beautiful morning sun, I went back inside. This is the final saying in the Gospel of Thomas. I have written my meager thoughts and contemplations on all 114 versus on this blog. Over that time my understanding of these sayings have deepened and the message of these sayings are sinking in. The message of Jesus is not to hope for end times or some rapture. It is not about escaping the earth. It is about living. It is about realizing that we are sacred and divine and indeed the sacred spark is in everything. The challenge is to live a sacred life with eyes open to see that holy spark. It cannot be perceived by the unenlightened mind but only by those who are awake. This saying is interesting...it starts with a saying of Jesus and then progresses to someone seeking to provide a commentary on this saying with another saying of Jesus. Again this saying speaks of mastery. Those who have found life through these teachings of the living one will master heaven and earth. The spiritually enlightened person is able to see through the personal crap of our lives and live with an equilibrium of mind and heart in their approach to life. This is true mastery. Life then becomes a servant to the wise one, rather than the person merely reacting to things happening to them. Discover the World! Now Renounce It! This is an interesting saying. When you have discovered the world and become wealthy. Does this mean when you have more than enough... when you can live comfortably without the world, do that. Step out of it. Not everyone has this luxury however. It is very easy to read into this a negative view of the world, but it speaks of a mastery of the world then laying down that power. Who Put That In My Backyard? The treasure is within each one of us. The treasure is within and without us. It is the spirit of the divine. How many of us have given away this insight lost in materialism, egotism and other temptations. When you ground in this truth of who you are, you are able then to give out of your own depths to others. I believe this also speaks to our application in the real world these spiritual qualities, such as peace, integrity etc. Jesus teachings are the teachings of direct revelation. However he is not content that he is awakened and can sit back. He offers to those who want to follow his way, exactly what he experienced. He does not want to be their lord and god sitting over them, rather he calls those who would choose his way to become him. He becomes the image of the divine twin...the mirror. He becomes the higher or angelic self that we can become. This path advocated by the Gospel of Thomas is not a religion is a spirituality...a path of direct revelation. I give thanks to God for this! The Adam spoken of here is the undivided Adam. Jesus does not point to us to become sons of Adam or sons of Moses. Rather he calls us to be children of the undivided Adam. We are children of God... Jesus calls us to original innocence.. to the spiritual self. We are divine. We are sinless children of God. So live it. Just as God is Love and we are children of God, so to are we children of Love. How do you know it? You live it! It is that challenging and that simple. This is one of the most blatant sayings in the Gospel of Thomas that reveals we are not talking about an orthodox gospel. God here is revealed as both a father and a mother. God could just as easily be called Goddess. She is our Mother. She birthed us and guides us. God in a sense is akin to the Taoist Yin-Yang. One whole yet masculine and feminine. God is the composite of all opposites. One need look no further than Thunder: Perfect Mind for more opposites. God has made the male and female one in God's self. To know that...to worship God as Mother or even Goddess is frowned upon in many faith traditions. And yet we have the tradition of God as Shekinah, Sophia/Wisdom, the Sabbath Bride, and the Holy Spirit...all feminine images of God. I believe Jesus is calling for a more holistic spirituality...where God is found everywhere and within everything. A central message of the Gospel of Thomas is to know yourself. Part of this means to know your weaknesses, as well as your strengths. Here Jesus challenges his students to be aware of ones weaknesses and head them off beforehand. What is our weakness? What trips us up from living a divine life? It is here that a good soul friend can help serve as an accountability partner, challenging you to live better than you already are. A wise person seeks to prepare some way that they may live a sacred life. Looking at the three major monotheistic religions, I cannot help but notice certain commone elements between them and Thomasine beliefs. I also notice some stark differences as well. The Thomasine faith is based on the teachings of Jesus in the Gospel of Thomas. Jesus of course came from Jewish faith. The belief of Jesus became belief in Jesus and Christianity developed along with doctrines such as the divinity of Jesus, the trinity, the sacrificial death and resurrection. Islam came and sought to reform it and bring it back to its original monotheism. In this post I hope to look at the three faiths and compare and contrast them in a personal way with my chosen path as a Thomasine. Just Give It To Them! Showing Jesus a gold coin, they said to him, "The emperor of Rome's people demand taxes from us." What strikes me about this saying is that it is not those who believe the right things who are Jesus mother and brothers... it is those who do the will of God. The Gospel of Thomas does not not teach the doctrine embraced by many Protestant Christians... "faith alone" rather it is a religion of deed more than creed. We are children of God and should act like it. So the question, I challenge you to think about... is how are you to live it?